The extremely violent clashes, with blind and bloody repression from the government and a several hours’ long siege by the students, determined to win, are all signs of a deep malaise among the students, but also in the whole of our Society. •	the conviction of many student without any proof, under unacceptable conditions. 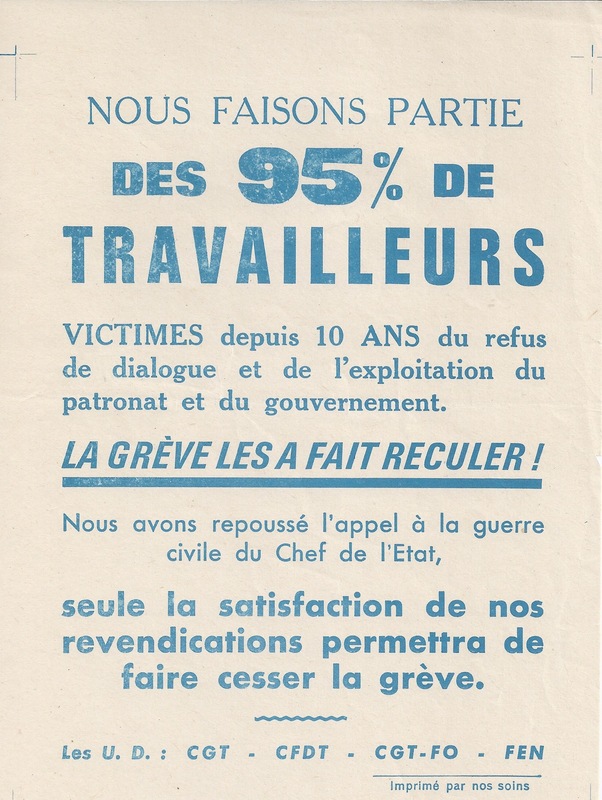 These instant arrests and convictions are new tactics that were inaugurated in Caen against the workers on strike, and which the workers will be the victims of tomorrow. Actually the large peaceful demonstration organised by the UNEF on Monday 7 May showed that students are perfectly able to keep order themselves provided that the police do not interfere. – The ANXIETY of the STUDENTS FACED with their FUTURE. TOMORROW WILL WE BE UNEMPLOYED, OR UNDER-EMPLOYED,? There is an important issue, about increasing the number of students, which poses the question of professional career prospects. The government has unilaterally decided to reject dialogue with both the students’ and teachers’ Unions on the authoritarian methods of selection for entry to the faculties. This method is used in exactly the same way to exclude a growing number of our own children from entry into further education. When were the parents’ associations consulted? •	If the number of sons of working-class families is so small in universities, it is the responsibility not of the students themselves, but rather of the system that the government enforces, which tends to shut the door of higher education to children of less well-to-do families. •	Whatever their social origin, students rebel as we do ourselves against a society which does not satisfy them, because it is led by oppressive capitalism and therefore is incapable of satisfying deeper human aspirations. If we are determined, this can be the beginning of a positive enterprise to build our new society not on anarchical production, waste, and wealth for same through others’ destitution, but on justice, solidarity, freedom. responsibility, and respect for every man, whoever he is. POSITION OF THE CFDT•	We workers must not let ourselves be led into unjustified reaction which would cut us off from our allies the students. •	the solution of the basic problems of the university: we are especially concerned that our children will beneﬁt from the solution. decided on by the union organisations. the C.F.D.T and the F.E.N. Public opinion has been shattered by the ferocious police repression which has been unleashed against the students and academics in the Latin Quarter. The repression has provoked spirited indignation against the regime. The union organisations C.F.D.T., C.G.T., F.E.N., C.G.T.-F.O. and C.G.C. have declared a general 24 hour strike for Monday, 13 May. the U.N.E.F.-U.G.E. and S.N.E. Sup. are carrying on with their strike. 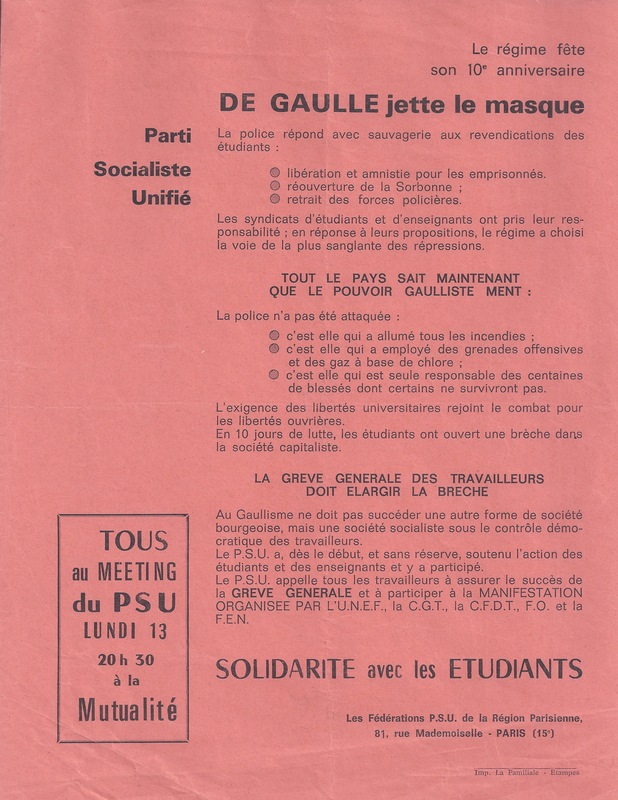 It is the determined action of the students and teachers in higher education, followed by the call for a general stake and the emotion expressed by a large part of public opinion as well as the attitudes of numerous political parties and movements that have forced the government to stand down. In the name of the solidarity which joins together the students. teachers and all the workers against police repression, let us unite. – A change in the economic system by and for the people. 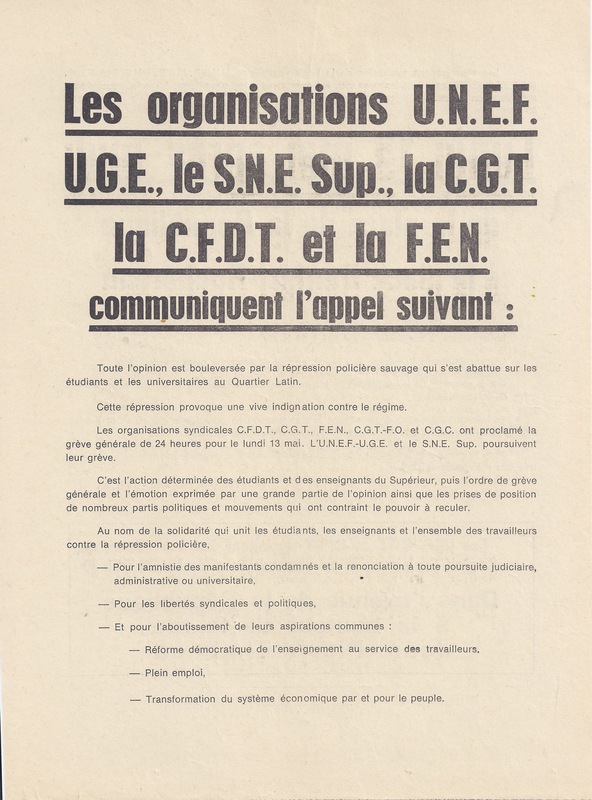 The trade-union organisations of the Paris region, U.N.E.F., U.G.E., S.N.E. Sup., F.E.N., C.F.D.T. and C.G.T., call on the students, teachers, workers and all the population to demonstrate en masse. The demonstration is set to leave at 3.30p.m. The C.G.T.-F.O. of the Paris region has also put out an appeal for this demonstration. On the route of the demonstration collections will be made by the organisations, on behalf of the victims of the repression. Welcoming the calls from parties and groups to participate in the demonstration, the organisers have decided to maintain the trade-unionist character of the demonstration. In the same spirit, the only papers which will be distributed will be those of the organisations who have signed the appeal. 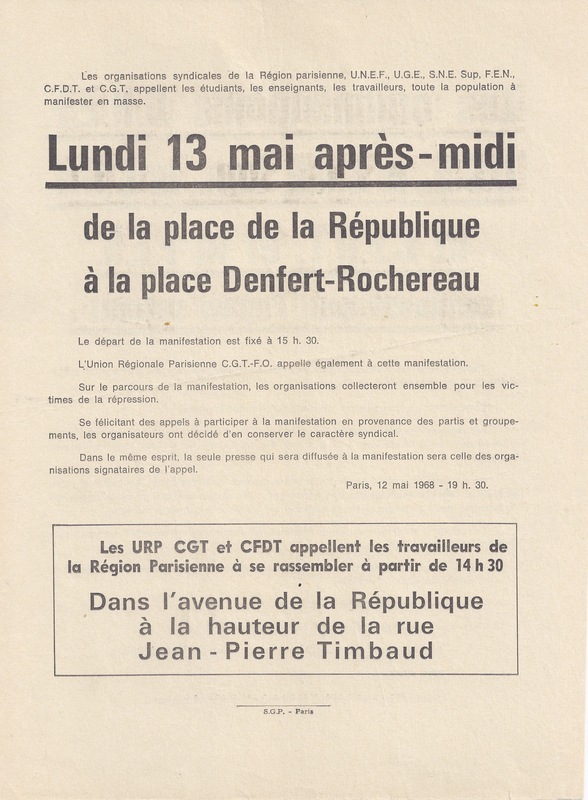 Paris, May 12 1968 – 7:30 p.m.
Paris Region to assemble from 2:30 p.m.
who have for 10 YEARS been the VICTIMS of the refusal of dialogue and the exploitation of employers and the government. THE STRIKE HAS DRIVEN THEM BACK! only the satisfaction of our claims will stop the strike. 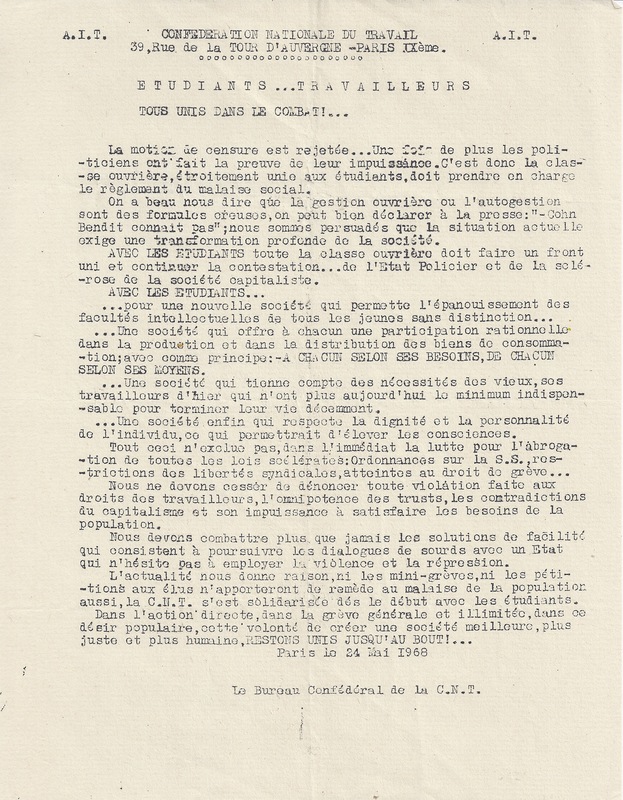 The Gaullist government has been forced to make its first retreat. 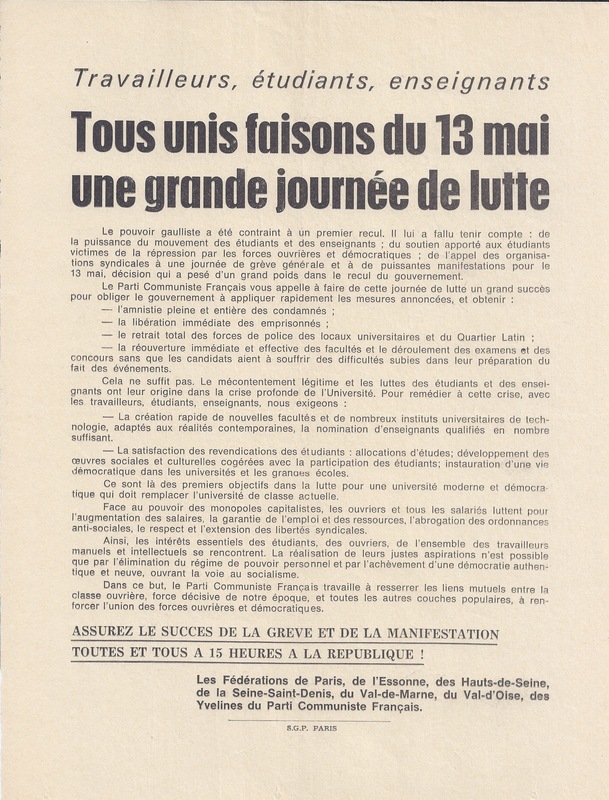 It had to consider: the power of the students’ and teachers’ movement; the support of the workers and democratic forces for the student victims of repression; and the call of trade unions for a general strike and powerful demonstrations for May 13 – which is a decisive factor in the government retreat. – the immediate reopening of schools and the conduct of examinations and tests without candidates having to suffer difficulties because of these events. – The rapid creation of new Faculties and technical colleges, suited to contemporary realities, and the appointment of a sufficient number of qualified teachers. – The satisfaction of the claims of the students: study grants; the development of social and cultural works co-managed with the participation of students; the establishment of a democratic life in universities and colleges. 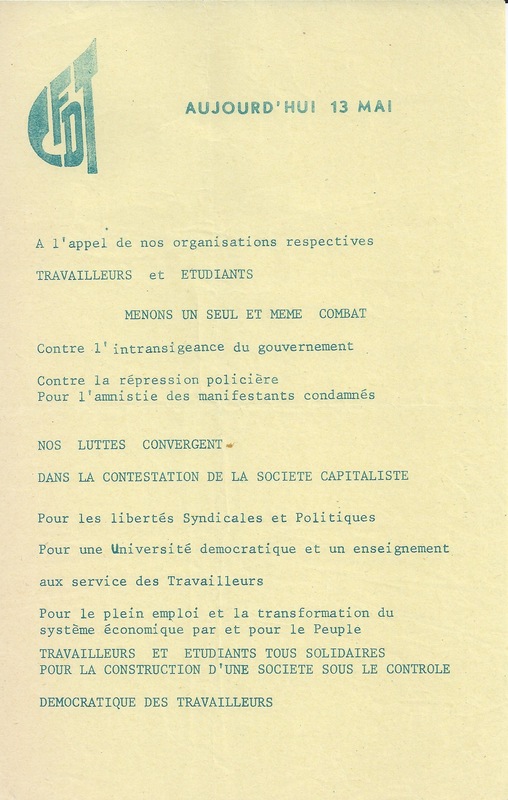 These are the primary objectives in the struggle for a democratic and modern University to replace the current class-based University. Against the power of the capitalist monopolies, the factory and office workers are fighting for increases in wages, the guarantee of jobs and resources, the repeal of anti-social orders, the respect and extension of trade union freedoms. Thus, the essential interests of students, factory workers, and of all manual and office workers converge. The realization of their just aspirations is possible only by eliminating this government of personal power and by the institution of a new and genuine democracy, paving the way for socialism. To this end, the French Communist Party works to strengthen mutual ties between the working class, the decisive force of our time, and all the other people’s forces, to strengthen the union of workers and democratic forces. EVERYONE TO REPUBLIQUE AT 3P.M.! The Federations of Paris, Essonne, Hauts-de-Seine, Seine-Saint-Denis, Val-de-Marne, Val-d’Oise, the Yvelines of the French Communist Party. What is happening at the O.R.T.F.? THE ARMY AND THE POLICE HAVE BESIEGED THE TRANSMITTERS. The pictures that you see, the news reports that you hear, are no longer ours, but THOSE OF THE GOVERNMENT. All the staff of the O.R.T.F. are on strike. For impartial NEW REPORTS, honest and complete. For INDEPENDENCE from the government, whatever it’s [composition]. THE FIGHT OF THE O.R.T.F. ON STRIKE IS THAT OF THE WHOLE COUNTRY.